Even though glycerine has been a staple in my stockroom for ages, it has remained one of those 'background ingredients'. These past few months, glycerine has made its way into a front and center position due to a series of glycerite how-to's on this blog. A glycerite is an extract made with herbs (flowers, or other substance) using glycerine as the main medium of extraction – a glycerine extract, if you will. That picture up there is a lemon glycerite being strained (and yes, it smells deliciously of fresh lemon). My recent glycerite how-to's have been so popular with you lovely readers that I have gotten all kinds of feedback and questions from you, so today we're going to take a closer look at glycerine. Glycerine is also known as glycerol. It's a clear, viscous (read: thick-ish, syrup-y) liquid that is sweet to the taste, slightly sticky to the touch, and categorized as non-toxic. Glycerine has multiple uses within the food, medical, and cosmetics industries. It has gazillions of applications. Yes, I'm exaggerating, but it really is very widely used. Glycerine functions beautifully as a 'water-look-alike' in photography and film studios because it stays where it is put until the shot is done. (Now you know how they can 'capture' that perfect moment of dewy-freshness under a million hot lights that would make real water evaporate in seconds). Glycerine can be made from both animal and vegetable sources. Vegetable glycerine is most often made from soy, palm or coconut. The non-plant-based version of glycerine is made from animal tallow. In skin care products, glycerine functions as a humectant – drawing moisture to the skin when it comprises under a certain percentage of a formula. It is generally recommended to keep the total content of glycerine to under 10%. Added at higher percentages, glycerine is claimed to do quite the opposite and draw moisture from the skin. However, from my research it looks like this is unproven. Dosage is everything when it comes to glycerine. 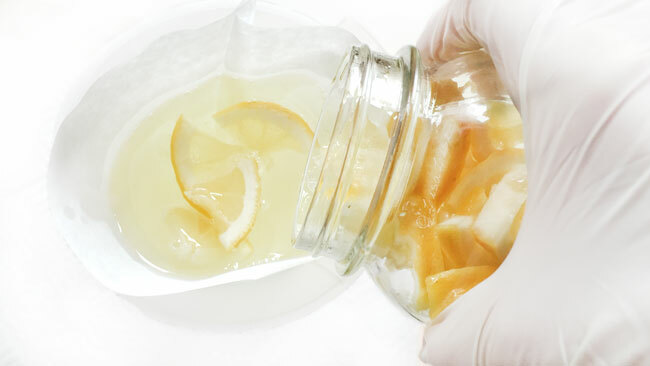 Another cool thing glycerine can do is function as a preservative, or aid to a preservative – and, again, dosage is pretty much the key. A proven ingredient with a long history of use, glycerine is an ideal addition to creams, lotions, serums, tonics, face mists and other products where moisture-boosting is desired. Soapy goodness: I'm sure you've tried (or at least heard of) glycerine soap, which is often recommended for sensitive skin types. Glycerine soap is easily recognizable because of its translucent quality. Guess which one of the soaps below has glycerine? Ok, that was a total trick question because hand-crafted soap (such as the 2 you see here) will always have a content of glycerine – even if the soap is not translucent. Companies that mass-produce soap will almost always separate out the glycerine to be sold and used in other products. The glycerine content of artisan soap could very well be why many people with sensitive or very dry skin will better tolerate them. Count yours truly as one. We're going to take a look at the function of glycerine in glycerites and examine its preserving properties. ... make Your Own Glycerite! How do you use glycerine in your products? We know that rubbing lemon on your face is photosensitizing, but does that also apply to lemon glycerite? I've always been wary of using glycerin, as I read that in very dry weather conditions it will actually draw moisture from your skin and hair (where I live, it can get very dry at times, eg yesterday's humidity was only 9%, and today 28%). Hi Riana - Thanks for your input! Glycerine really is all about dosage. I will usually keep it around 5-7% for leave-on products. Some even keep it down as low as 2%. Best of luck with it! I saw glycerine on the ingredient list of a balm made only with shea butter, oils and essential oils. I thought that glycerine can not be mixed with oils? I am really confused about this. This a well knows natural cosmetic brand. Hi Audrey - This can be confusing because of the numerous names. Glycerine 99% (or glycerol) has the same INCI name but have different characteristics.You will find glycerine listed on some lip balms but it is most likely glycerol. Great post here....if I may ask what is the difference between glycerine and glycerol. I recently tried a sample lotion that I liked. The ingredients did not include any water-based ingredients other than glycerin and the only emulsifier was beeswax... I am familiar with making lotion using a water phase, and oil phase and an emulsifier, but I'd never seen anything like this. Have you ever tried anything similar? Hi Abby - this sounds like an anhydrous formula - but then glycerine has been added. I have heard of some adding glycerine to otherwise anhydrous formulas (lip balms etc), but the reason for doing so escapes me. I haven't tried it myself, but am a bit curious to look into the reasoning behind this. Thanks for inspiring me to do a bit of digging and perhaps do a blog post on this! Lise, yeah, it was definitely anhydrous. The sample that I tried was similar in consistency to an anhydrous body butter, except it seemed to soak into the skin more quickly and be slightly less greasy. I was intrigued, and thought you might be as well! Hi Abby - The greasiness in body butters can be reduced by introducing additional anhydrous ingredients such as tapioca powder or cornstarch. This would be my go-to before introducing an ingredient with a water content. hello Lisa, I have a bottle of Glyceryn 99.5% Anhydrous, was wondering if you know of a way I can make myself a bubble bath? TY!